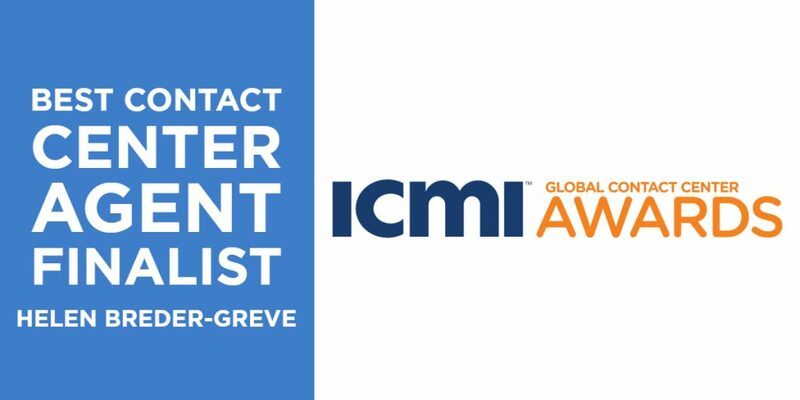 HighPoint Senior Customer Service Representative, Helen Breder-Greve, has been selected as a finalist for the ICMI Global Contact Center Awards in the category of Best Contact Center Agent. Through her dedicated work, Breder-Greve has maintained high performance while receiving ongoing accolades from the customers she serves. Helen works in a federal call center answering calls from people looking to come to the United States to pursue education (elementary through college) and guides them through the process for obtaining or renewing a student visa. She also helps schools maintain their certification to enroll foreign students, as well as lawyers who are helping people obtain visas. The ICMI Global Contact Center Awards Program is a comprehensive awards program dedicated to the customer service industry. It is designed to honor and recognize the companies, contact centers and individuals that provide a platform for leadership, vision, innovation and strategic accomplishments for the industry. The winners and finalists of the ICMI Global Contact Center Awards will be recognized and celebrated at the ICMI Contact Center Awards Party on May 14 during the Contact Center Expo held in Ft. Lauderdale, Florida. Additional information about the event and finalists can be found on the event page at www.icmi.com.